This link is inproper storage and carry, even this father knows that you never carry a gun with a chambered round. I'm pretty sure this father will have to live with his stupid mistake the rest of his life. This is a stupid accident and would have been avoided by proper carry, following the rules. Now a proud member of the NRA & Canadian Sport Shooting Association. A shooting at a Connecticut elementary school Friday left 27 people dead, including 18 children, an official said. The official spoke on condition of anonymity because the investigation was still under way. Another official, speaking on condition of anonymity for the same reason, said the gunman at Sandy Hook Elementary in Newtown was killed and apparently had two guns. The superintendent's office said the district had locked down schools in Newtown, about 60 miles northeast of New York City. Schools in neighbouring towns also were locked down as a precaution. A dispatcher at the Newtown Volunteer Ambulance Corps said a teacher had been shot in the foot and taken to Danbury Hospital. Andrea Rynn, a spokeswoman at the hospital, said it had three patients from the school but she did not have information on the extent or nature of their injuries. State police said Newtown police called them around 9:40 a.m. A SWAT team was among the throngs of police to respond. 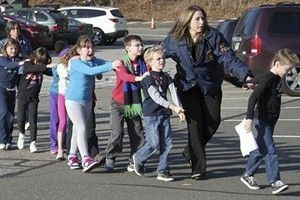 A photo posted by The Newtown Bee newspaper showed a group of young students - some crying, others looking visibly frightened - being escorted by adults through a parking lot in a line, hands on each other's shoulders. Mergim Bajraliu, 17, heard the gunshots echo from his home and raced to check on his 9-year-old sister at the school. He said his sister, who was fine, heard a scream come over the intercom at one point. He said teachers were shaking and crying as they came out of the building. The White House said President Barack Obama was notified of the shooting. Unless you can show me some proof your just making that up, in fact! all but one of these mass shootings in the US have taken place either in States that don't allow carry or in a place like the theater in Colorado where it's posted "guns are not allowed in the building". Killing children? That's just sick. True. But this will be the price to pay if all law abiding citizens can carry. There is no easy answer as each side of the coin can and will result in innocent lives lost. steelrules wrote: In reply to Goatboy. Take the money everyone wants to add to gun control and put it where it belongs. Mental health!! Guns dont kill, sick people do. MY GREATEST FEAR IS, THERE IS NO PMS, AND THIS IS MY REAL PERSONALITY. Captain Awesome wrote: Killing children? That's just sick. You choose to insult instead of bringing a meaningfull argument, your not really worth my time. But I will tell you this much, I live buy the laws of this country, my guns are locked in a safe & triger locked at all times, my ammo is kept in a seperat locked steel cabinet, and I have security cameras on my house. Above and beyond what is required by law in Canada, I am what is known as a responsable safe gun owner. Didn't this happen recently in Norway? It also happened in Scotland. Why point fingers at the US? Society is sick and no one wants to heal it. Rookie, because it is easier to point a finger than it is to make an intelligent remark. Because it is easier to point a finger rather than be informed. "Let there be smoke." And there was smoke. And it was gooooooood. Well, I think the proof must be in the fact that these type of shootings happen more frequently in the US than other 1st world countries. Don't mix up the deterrence of open carry to targeted violent crime such as robbery, home invasion etc vs mass shootings. A mass shooter is not going to be deterred by open carry because their motive is not rational and they do not fear death. Nearly every one of these shooters ended up shooting themselves (which also looks like this most recent shooter did) so their own death during these shootings (whether by someone else or themselves) was obviously not a concern for them. Robbery and home invasion has a purpose and, like a home alarm, the criminal will go for the easy target. They also do not go into the robbery with the intent of killing themselves after doing it. The only thing lax gun control may contribute is the elimination of the shooter after the shooting has begun. And this type of gun control is appropriate for the type of civilized country I wish to live in. My heart breaks for those children & adults killed. My heart aches for the parents who have lost children, family members who have lost family members. My heart breaks for those children who witnessed this horrible tragedy....they will need so much care, love and support to get through this. This is the tragedy people....sensless slaughter of innocent people because of one mentally ill person. The US will never stop allowing people to carry guns, there is too much money in it. As someone else stated, put the money into helping the mentally ill who can snap for no reason. Hugs your kids, spouse, anyone close to you today....you never know what tomorrow brings. goatboy wrote: Well, I think the proof must be in the fact that these type of shootings happen more frequently in the US than other 1st world countries. Again, correlation does not imply causation. Sweden has one of the toughest drug laws in the world, and one of the lowest drug related crimes. Does this mean that tough drug laws prevent drug abuse problems? No. The USA also has tough drug laws, and yet they have some of the biggest drug related crimes in the world. Does this mean that tough drug laws mean you get more drug use? Again, no. Correlation does not imply causation. Switzerland has high ownership, and they have low gun crime. Does this mean that more guns means lower crime? No. The USA has high gun ownership, and they have lots of gun related crime. Does this mean that more guns means more gun crime? Again, no. Correlation does not imply causation.